Blackmagic Pocket Cinema Camera as the main camera and DaVinci Resolve at the stage of color correction were used for 'The Sower'. In that relationship, "The Sower" is introduced on Blackmagic's website. プロニュースさんでも掲載されました。 It is also published in the PRONEWS. "The Sower" will be introduced at "Nippon Connection Special Feature". It's a part of the NHK World's "J-FLICKS" Broadcasting schedule is scheduled twice: July 1st and August 26th (13:10-13:38 / rebroadcast 20:10-20:38 / 25:10-25:38 / next Sunday 7:10-7 :38) The NHK World is available in approximately 140 countries. In Japan, you can watch it with cable TV or smartphone and tablet's free app. Please do not miss it. You can check the more information in the following URL! 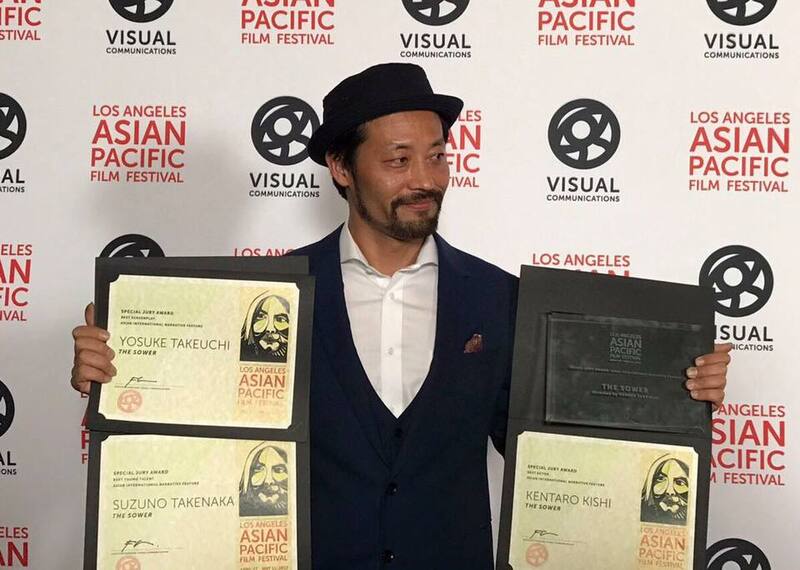 The Asian Pacific Film Festival is over and "The Sower" has won four awards in the International Competition category! Thank you to all the people involved with the movie. I'm grateful to you all! 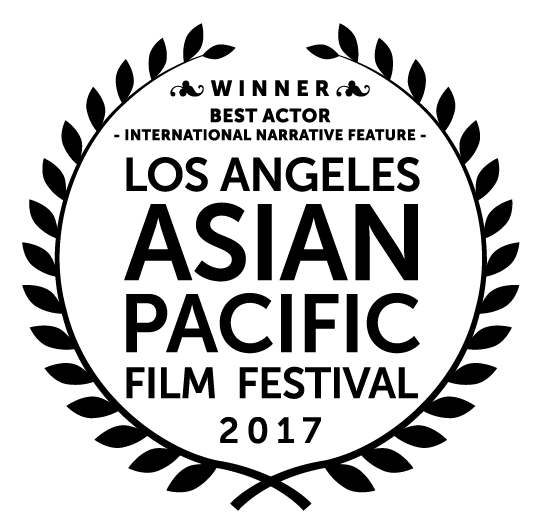 "The Sower" is nominated to the international competition of LOS ANGELES ASIAN PACIFIC FILM FESTIVAL, to be held during May 5 from April 24. It's the first time for "The Sower" to be screened in America. Many people might not fully apprehend the importance of Thessaloniki’s Film Festival. I’m not blaming them, of course. If you have never been at a screening and if you’ve never experienced the feeling that it’s not just about another festival that shows movies, but it’s a festival that gives opportunities and turns cinema into a deed of fellowship and admiration between the audience and the creators, it’s hard to realize its worth. The worth of Thessaloniki’s Film Festival can’t be found on the films of the big and known directors, who just decide to have the premiere of their new film at the festival. Everyone is somehow prepared at one point for these films. I’m not doubting, of course, their quality and I’m not the one who can judge whether a film is worthy to be screened at the festival. But this year at 57th International Film Festival of Thessaloniki the movies that stole the show where the ones least expected. One of them is “The Sower”. 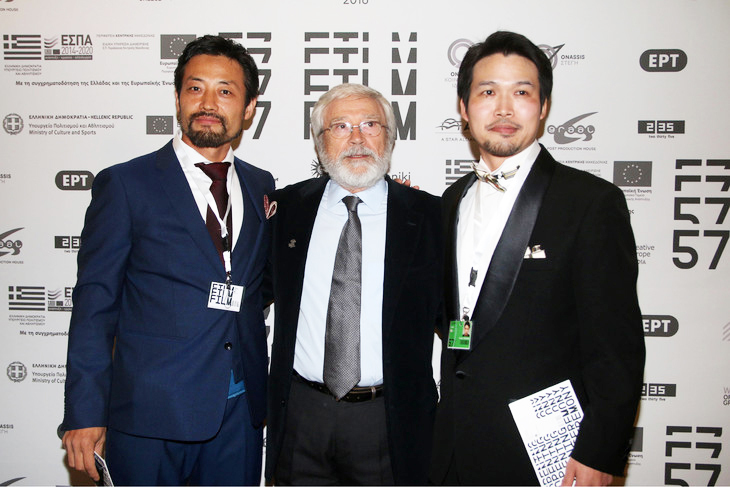 At Thessaloniki’s Film Festival Asian movies have always had a special place, with examples like “Like Father, Like Son” of Hirokazu Koreeda to make us proud. And even if in the program of the festival it was included the name of Kiyoshi Kurosawa (he is known here), everyone ended up talking about The Sower of Yosuke Takeuchi. Many artists at the film field are trying for years to find the secret for a successful movie. Good scenario, directing and photography well combined, music that raises the attention, well-paid famous actors and a good budget. Let’s call it the cliché film package. However, many people seem to ignore the fact that the basic ingredient for a film is not the technical part, but the ethical one. It’s clear when a director and creator is honest to his film. You have to respect and to tell the story honestly and not forget for a second that it’s about art, not business. Yosuke Takeuchi seems to manage it without a second thought. He is telling us the story of Mitsuo (Kentaro Kishi), who has just been released from a mental house and he visits his brother’s family, Yuta (Tomomitsu Adachi). He will meet there his two nieces, Chie (Suzuno Takenaka) and the 3-year-old Itsuki (Ichika Takeuchi) with Down syndrome. And even if the movie begins as if it’s a happy reunion, everything will change after Chie’s lie. People’s relationships are being tested with several ways. It’s worthy for someone to watch how a person ends up being burdened with all the sufferings of a family, from the past and from now, because of a lie. Chie is afraid to admit that she killed – maybe not by a mistake – her little sister, and she will blame her uncle. And even though the story seems to be based on that fact, what really reflects the feelings of the main characters is the dialog between Mitsuo and his niece, Chie, at the start of the film. Mitsuo is telling his niece his experience of a night he slept outside, and he saw the orange sky of the sunset and the sunflowers. Chie will ask him at the end of his story, “Did you see them? The dead people”. Her sister was born at the year of the big earthquake in Japan, and she seems to always look at the sky. “Me and Itsuki don’t look alike, right?”. The Sower combines ethical and psychological issues in a way that it firstly makes you wonder with the fact that the reactions of the family are really realistic, and then it makes you think that even if those events didn’t happen, the mentality of the people might not have been changed. Firstly, we get to know about the personalities of Mitsuo, Chie and Itsuki, who seem to share something more than just their family bonds. Every one of them seem to be alone and different for a reason. Mitsuo is a man who just left the mental house. Itsuki is a three year old girl with a Down syndrome and was born at the year of the big earthquake. And Chie seems to be a quiet and well-intended girl who, on the one hand helps her sister, but on the other hand, realizes the difference between them. After Itsuki’s death the rest of the family will reveal their feelings too, with the explosion of Chie’s mother, Yoko (Arisa Nakajima), towards her husband, blaming him that all of his family is crazy and that it’s his fault, and that in reality he doesn’t even seem to be sad about his daughter’s death. Yuta doesn’t seem to object nor to agree. During the film he seems to be rather apathetic, and the only moment that he actually does something is when Mitsuo desperately offers him money for their forgiveness. Generally, we can compare in a similar way the film of Yosuke Takeuchi with the Danish movie, The Hunt, of Thomas Vinterberg. In both films we see two people being stigmatized because of a lie and everyone around them turning around them, when they don’t do anything to defend themselves. The difference between the two movies, though, is the fact that in The Sower, Mitsuo didn’t want or try not a little bit to convince his family for the opposite. He tried to atone, to do things for them to forgive him, but he never expressed anger or the slightest try to say or ask for the truth. Mitsuo, perfectly impersonated by Kentaro Kishi, didn’t speak much during the film. After the story he told to Chie he seemed to stay quiet. His acts spoke for him, and that’s what is really moving about the interpretation of the actor, which even though he didn’t use any words, it was really honest. The same thing, of course, can easily be said about little Chie, who was born not in the scenario of Yosuke Takeuchi, but in the spontaneous feelings of the actress, Suzuno Takenaka. The director preferred not to give a script to the young actress and let her express her feelings freely during the film. The Sower is a film that maintained fully the Japanese cinematic aesthetic, both in the plot and the way that it is presented in the film, and in the directing and the photography’s palette, director of which is the main character of the film, Kentaro Kishi. The Sower will teach you a lot of things about ethic and loneliness. It’s a film that will be recorded as one of the best existential Asian movies of 2016 and a film that will be unforgettable for those who watched at 57th International Film Festival of Thessaloniki. 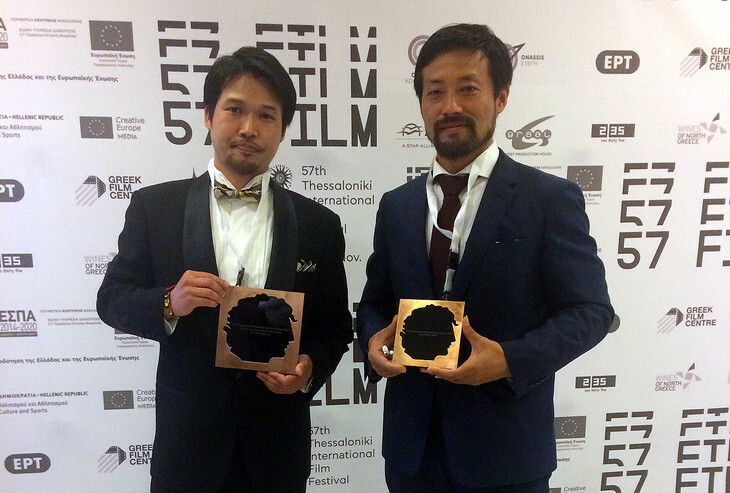 Reasonably, won two awards at the festival, Bronze Alexander for Best Director from the Special Jury, and Best Actress for Suzuno Takenaka. The Sower is exactly what its director wanted to be when he looked at Vincent Van Gogh’s “The Sower”. A black, unspecified figure who sows in a field with sunflowers, with a huge sun behind him. The loneliness, the regrets and the try of rebirth of oneself inside of the mistakes, ours and others. If you still haven’t watched The Sower, it is without a doubt worthy to include it in your list.